Arguably the best classic American breakfast food for an easy-going morning, great pancakes can be found in abundance in Connecticut. Topped with a pat of melting butter and a drizzle of real maple syrup, these fluffy, light, and grilled to a perfect golden color pancakes are ready to hit your mouth. From mom and pop shop to tiny trendy spots, here are the best places for pancakes in the state. Rise is a tiny new eatery with a handful of perpetually packed tables and stool seating. Enjoy their locally-sourced ingredients that form the basis of their carefully crafted menu. The Cakey McPancakes, packed with bittersweet chocolate chips, are delectable as are their regular buttermilk pancakes to which you can choose to add strawberries, blueberries, banana, chocolate chips, pecans, or coconut. All pancakes are served with help yourself amounts of Bobo’s Maple Syrup. Dig into fluffy pancakes at Noah’s from Tuesdays through Sundays during breakfast or brunch. This cozy restaurant is decorated with local artwork, your cup of coffee is never empty, and the meals are divine. For pancake options, Noah’s offers buttermilk and Dos Wild Blueberry Pancakes, both served with maple syrup from Farm Sugarhouse in Conway, Massachusetts. Meals here are creatively named after events, characters, and habits in JRR Tolkein’s “The Hobbit” and “The Lord of the Rings.” Foromir’s Flapjacks are affordably priced and perfectly delicious. If pancakes aren’t what you’re after, the Shire Café also offers Elven Bread (French toast), Elevensies, and the Frodo. Expect a plate piled high with pancakes, strawberries, and whipped cream at the Laurel Diner. Have a bottomless cup of coffee to go with a stack of pancakes topped with pecans, bananas, and coconut for a taste of the tropics during a chilly day. Other specialties include corn beef hash, cinnamon roll French toast, and home fries. Originally opened in Orange, Chip’s Restaurant is known throughout the state for its pancakes and has since recently expanded due to their popularity. Nearly 20 different pancake flavors are available at Chips, with eye-catching flavors such as s’mores, potato, coconut crunch, and more. They even offer a build your own pancake option, where you can choose from 21 different add-ins and two batters. Find additional locations in Fairfield, Southbury, Trumbull, Wethersfield, and Southington. Heirloom incorporates locally-sourced and artisan ingredients to create beautifully flavorful and unique menu items. Though menus change frequently, their fabulous brunch offers options such as apple doughnuts, quinoa bowls, French toast, and of course, pancakes. The pancake dish currently on the menu is buttermilk pancakes with or without blueberries. The Yolk Café is a neighborhood breakfast and lunch spot that is favored for their hearty classics served with a sense of humor. One of their breakfast specialties is three buttermilk pancakes that can be made with added strawberries, blueberries, or chocolate chips. The fun kids’ menu even offers pancakes in the shape of Mickey Mouse. Serving breakfast all day long, Somewhere in Time can fill your pancake cravings at any time of day. The pancake menu includes buttermilk, whole grain, and build your own options. 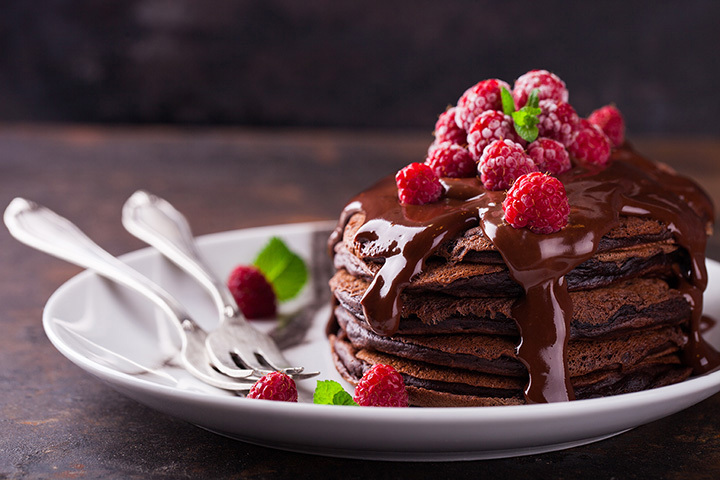 Additional ingredients to be incorporated into pancakes include blueberries, cranberries, walnuts, almonds, raisins, granola, chocolate chips, and cream cheese. Coffee is also help yourself at Somewhere in Time. Harvest Café and Bakery also serves breakfast all day, with numerous delicious options on the menu. In addition to French toast, crepes, and egg dishes, Harvest Café and Bakery also offers a nice selection of either buttermilk or gluten free pancakes. For even more flavor, pancakes can also be cooked with blueberries, bananas, strawberries, chocolate chips, almonds, pecans, or walnuts.